What should you do with that leftover chicken? 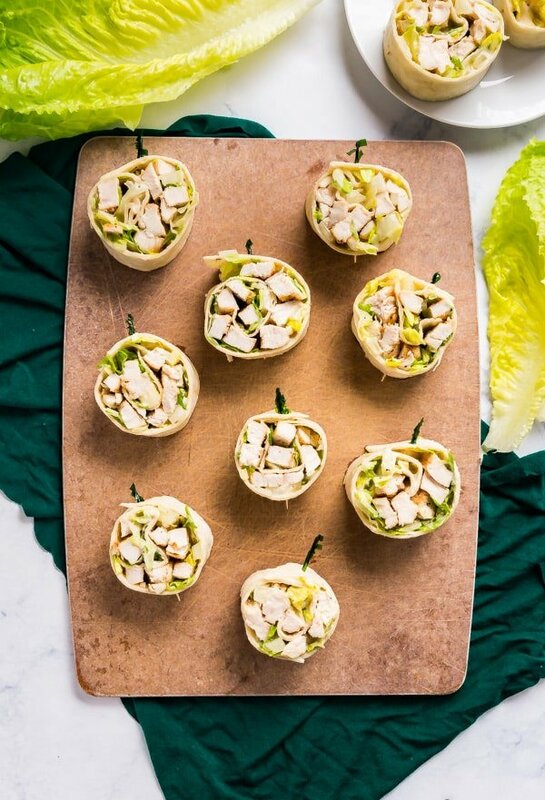 Make Chicken Caesar Pinwheels, of course! 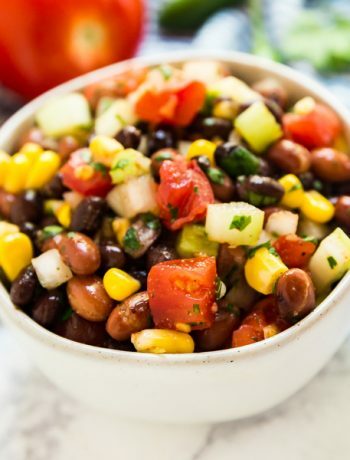 They’re super easy to make and are a seriously delicious lunch or healthy appetizer. Do you ever find inspiration in the most unexpected places? I know I do. One minute I’m hanging out, eating something tasty and minding my own business, and BAM! Inspiration strikes! The inspiration for this particular recipe actually came a bit later (and by a bit, I mean several years). When I was 19, I moved to NYC. It was a bold move, but the very best thing for me. Being that I’m from Western New York, getting home was as simple as hopping a quick one-hour flight, and I was often able to find excellent deals on airfare. On those fateful flights home, I had one standby snack that I always seemed to gravitate to at JFK (this was long before the days that Jetblue had a big, fancy terminal). 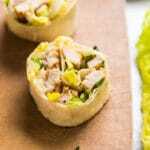 They always had these Chicken Caesar wraps that were cut into pieces, resembling little pinwheel sandwiches. They were super light and full of tasty flavor, and although they were way expensive (hello airport food!) they were a good way to hold me over until I made it home to all that great home cooking! Use leftover chicken: I can’t stand food waste. 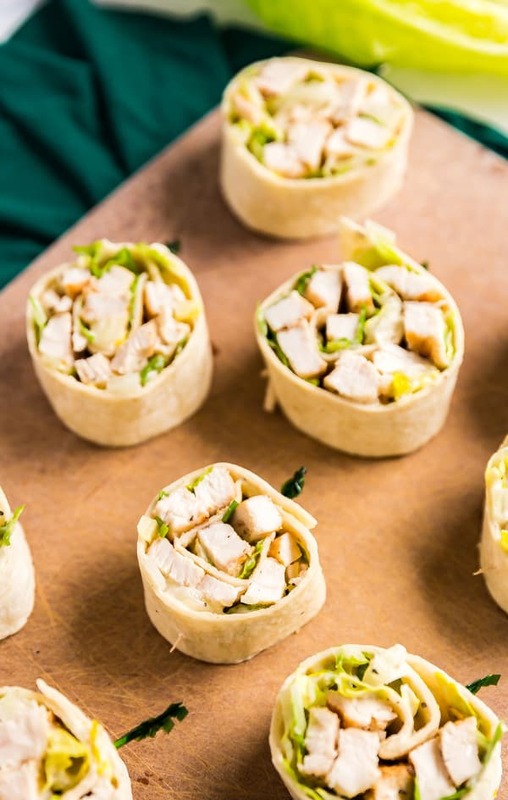 These are a delicious and healthy way to repurpose leftover grilled or rotisserie chicken. Spread the dressing in a thin layer over the whole tortilla: not only is it delicious, it also helps to adhere the ends of the tortilla a bit. 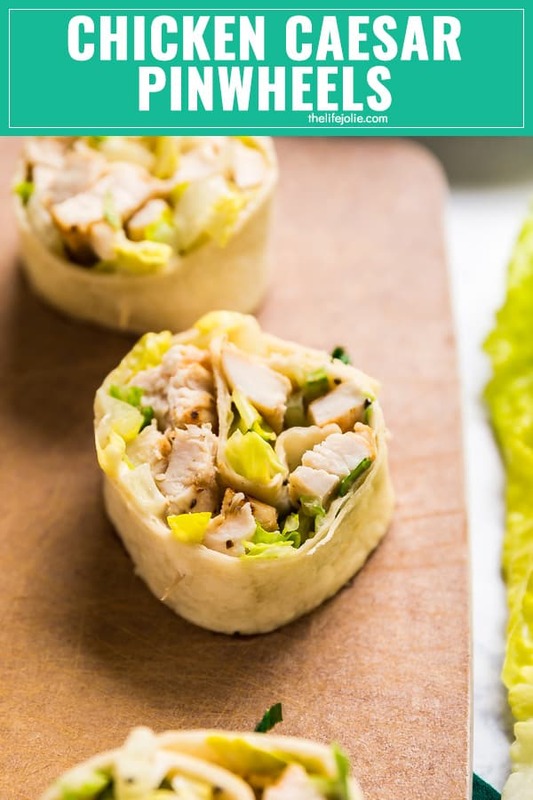 Lightly shred the lettuce and chop the chicken into small pieces: this makes for easier cutting (to take it from a wrap to actual pinwheels) and cleaner eating. Feel free to throw in your favorite add-ons: I kept these pretty simple, but there are so many add-ons that would be awesome additions. Tomatoes, red onion, pepperoncini, kalamata olives, mushroom; the world is your oyster! Make sure you wrap it tightly: you don’t want your pinwheels falling apart on you! Use toothpicks for additional security: bonus points if they have fun little frills at the end. So festive! What should you do with that leftover chicken? 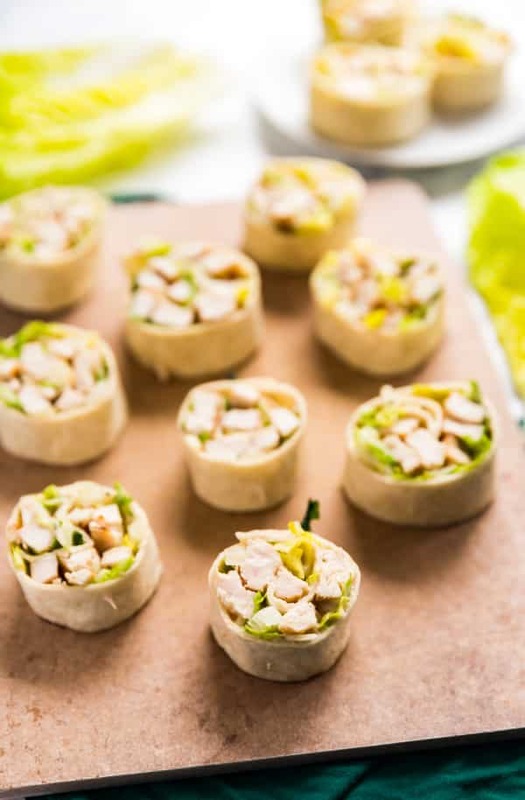 Make Chicken Caesar Pinwheels, of course! 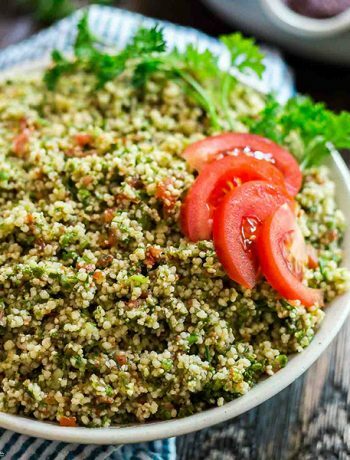 They're super easy to make and are a seriously delicious lunch or healthy appetizer. Lay the tortillas out on a cutting board. 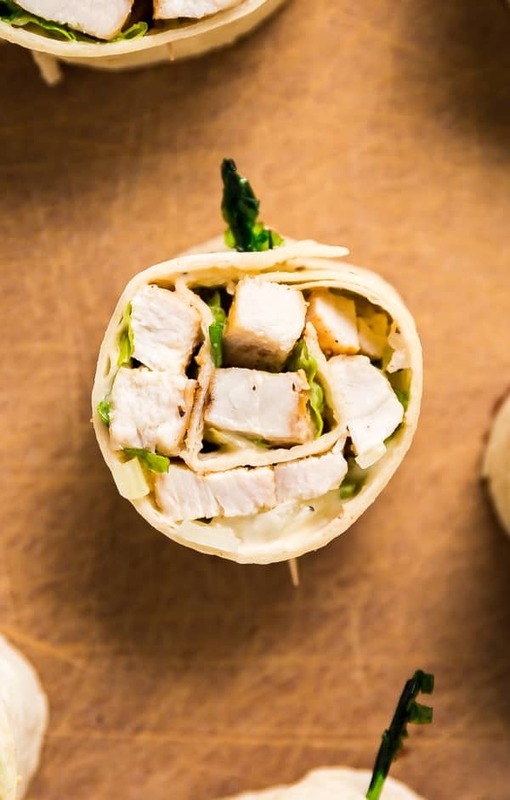 Spread a thin layer of Caesar dressing onto each tortilla, to completely cover it. 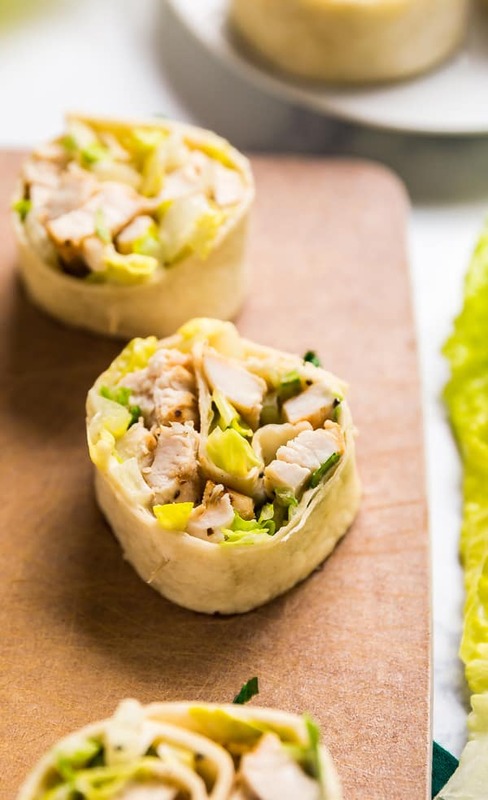 Scatter chicken and Romaine lettuce evenly over the tortilla. Carefully and tightly roll the tortilla up and away from you, leaving the seam side down. 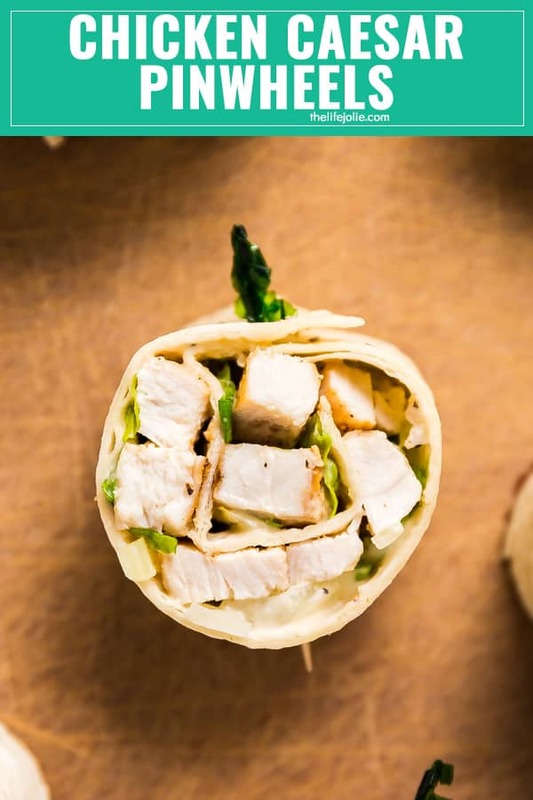 Cut the wraps into 1 inch thick slices. Carefully insert a toothpick into the seam of each slice to hold it together. 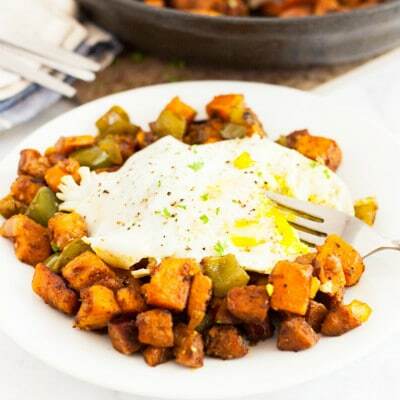 Looking for some other great lunch recipes?